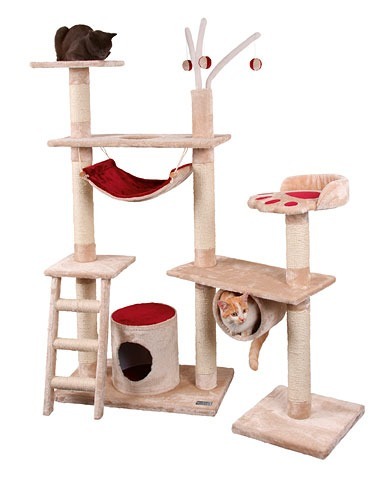 The Cat Tree Silverstar is a stunning cat tree from world leading pet manufacturers, Kerbl. The Cat Tree Silverstar has several playing platforms for your feline friends to climb in explore to their hearts content. Not only this, but if they want to get away from the world and have a little bit of ‘me’ time, then they can escape into the kitty cocoon included. If you have multiple cats they do not worry. as you can see from the picture, the Cat Tree Silverstar is more than capable providing an entertaining environment for multiple feline friends. Scratching is an important part of your kitties basic instincts. Trust me, they don’t do it just be annoying! Keeping your feline friends claws away from your precious furniture can sometimes be a struggle which is why the Cat Tree Silverstar has several high-quality scratching posts wrapped in natural sisal, where they can really go crazy with their claws without it being at the expense of your new sofa!